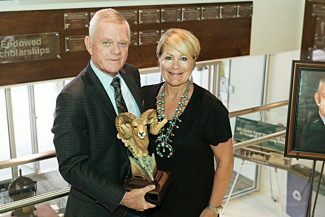 The Colorado State Univeristy Department of Animal Sciences recognizes Bill Hammerich as Livestock Leader of the Year, Sept. 8, 2017. The Colorado Livestock Association was formed in 1998 through a restructuring of the then-43-year-old Colorado Cattle Feeders Association. CLA members are cattle and sheep feeders, cow/calf producers, dairy farmers, swine operations, and industry partners. CLA works on behalf of its members in the regulatory and legislative arenas in Colorado. Additionally, CLA has a strong safety and workers compensation program comprised of livestock producers that benefit from pooling their resources and developing a strong safety culture on their operations. For the past 15 years, Bill Hammerich, CEO of the Colorado Livestock Association, has been an advocate for livestock producers across the state of Colorado, producers who have long relied on Colorado State University research and outreach. As just one more example of the importance of the relationship between industry and CSU's College of Agricultural Sciences, Hammerich has been named the 2017 Livestock Leader, an award given each year by CSU's Department of Animal Sciences. Hammerich's recognition bridges many of the industries represented by previous Livestock Leaders who have been feedlot owners, sheep producers and cattle nutrition experts. "Bill Hammerich has served as a mentor to industry leaders and faculty here at CSU, including me," said Kevin Pond, head of CSU's Department of Animal Sciences. "His vision for and support of initiatives and legislation that will advance the efficiency, safety, and productivity of livestock producers across Colorado, has helped solidify this state's status as an agricultural leader across a number of livestock commodities." A 1969 alumnus of Colorado State University with a degree in agricultural economics, Hammerich grew up on a cattle and farming operation in western Colorado. Following graduation, he began his working career with Monfort of Colorado, then Farr Feeders and was with the Sparks Companies before joining CLA. His time spent in the cattle feeding industry provided him not only with an understanding of how to feed cattle, but also the importance of protecting and sustaining the environment in which one operates. "As the recipient of the 2017 Livestock Leader Award, I would like to thank everyone who made it possible," Hammerich said. "This is a great honor for me personally, but I would be remiss if I didn't acknowledge the fact that I have had the good fortune during my career to have the support of my family and a number of individuals who are considered to be industry leaders." Hammerich and his wife Sabrina live in Severance, Colo., and have two grown children, Justin and Jessica, and four grandsons.